Learn how to download Chrome on Windows 10. This tutorial will not only guide you to download Google Chrome on your Windows 10 computer, you will also be shown other requirements and tips before downloading the browser. Google Chrome has incorporated with many device manufacturers. Hence, most of the devices usually come with Chrome browser already installed. This is also applicable to mobiles. Chrome is preinstalled in almost all android phones and this move has gone along in placing chrome ahead of the competition. Chrome can work perfectly on Windows 10, 8 & Windows 7 operating systems. It also works on Mac operating systems, Linux and Android. 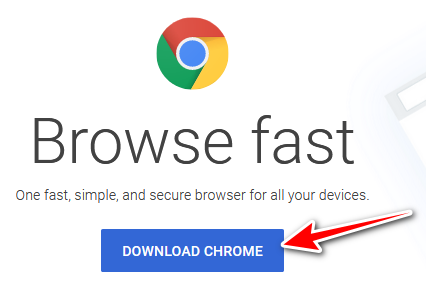 Let’s quickly run through the process of downloading and installing the Google Chrome browser on your computer. How to download Chrome Browser on Windows 10. To download simply visit this page with your browser: https://www.google.com/chrome/. 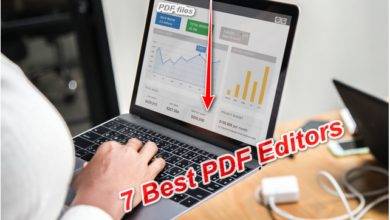 Right there on the landing page, you will find a blue download link as shown below. Read through the Google Chrome terms of service to see if you agree to their terms. If you wish to continue, click the “Accept and Install” button. 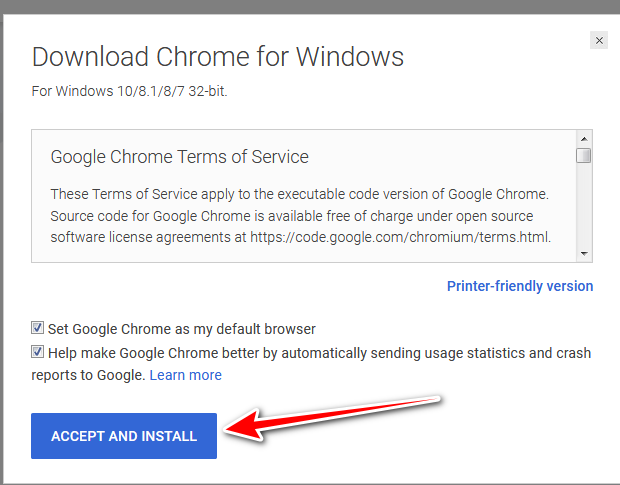 You can choose to make Chrome your default browser immediately after installation by selecting the option “Set Google Chrome as my default browser” before you proceed. Save and run the Chrome installer from your computer when the download is fully complete. Features of Google Chrome Browser. Chrome is a very simplistic web browser. It is very fast and prolific. Chrome is a brainchild of Google. It is designed to offer users a fast. browsing experience. Pages can load within seconds allowing the quick loading of pages. It free offered free and users can download from the google play store. Chrome is friendly for users in a multiplicity of devices. It works perfectly on laptops, desktops and mobiles. Newer products come with the chrome software already installed. Chrome is optimized for modern web experience. It is simple and secured. There are many juicy features of this great browser. Chrome can lessen your typing in the search or website space, by suggesting searches. This helps in completing web addresses. 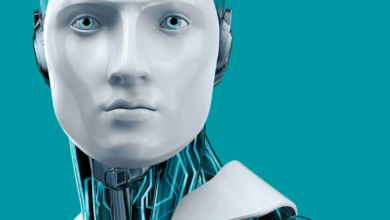 Chrome has differentiated itself from its contemporaries. Aside from the fast and secure browsing experience, Chrome offers simplification to users in data entry. It automatically saves your data such as passwords, names, payment information, phone number, emails, etc. Chrome automatically fills registration forms, payment forms, login forms, survey forms, etc across all devices. 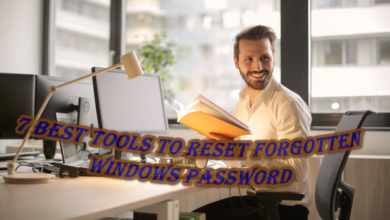 With this, users are relieved from clicking “forgot your password” as chrome automatically saves passwords and Google user accounts. After installing Chrome on your Windows 10 computer, you can use the incognito function to browse anonymously in private mode not allowing the browser to track your history or save cookies. This gives room for you to access private sites without being monitored by others. Google Chrome allows users to drag and drop browser tabs into browser windows and mix to match them. Even closed tabs can be accessed with ease. One other unique feature of the Chrome browser is that the address bar serves a dual purpose for Google Search and address bar. Users can synchronize bookmarks and other settings and history. This can be accessed across many other devices. 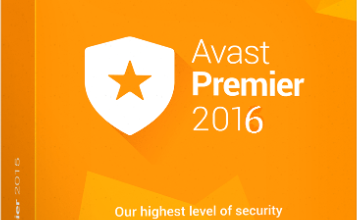 I’m terms of security, Chrome browser offers great protection to users. It will provide you with a warning when you are about to enter websites that have been flagged as harmful. I am glad you now know how to download Chrome on Windows 10 operating system. You can contribute to this post by using the comment box below. Thanks for reading.